Evidence of functional and morphological changes in small nerve fibers has been shown in several painful disorders that do not have the clinical characteristics of small fiber neuropathy. The role of the small fiber pathology in these disorders remains to be defined, in particular the question whether it is causative to the pain in the disorders or whether it is a secondary phenomenon that needs to be answered. 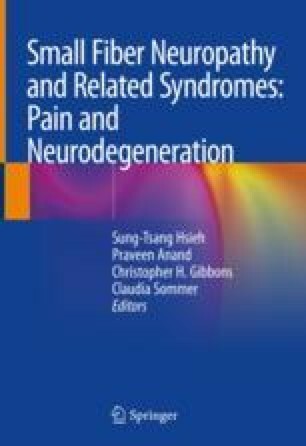 Skin innervation is reduced in the complex regional pain syndrome (CRPS). CRPS is a disorder that occurs after trauma, mostly a bone fracture, and where part of the acute pathophysiology consists in exaggerated inflammation with edema. At later stages, trophic changes are present. Since the intraepidermal nerve fibers are in a constant neuroplastic process, such changes in their environment may well induce a lack of regeneration and thus decrease their density. Fibromyalgia syndrome (FMS) is characterized by chronic widespread pain, mostly localized to deep tissues, and associated symptoms like morning stiffness, depression, and unrefreshing sleep. The finding of small fiber pathology in the skin in these patients was unexpected; however, it was independently confirmed by researchers in different geographical areas. Furthermore, pathologic function of small fibers and their afferent tracts has been shown by using specialized evoked potentials, quantitative sensory testing, and microneurography. The relation of small fiber pathology to FMS symptoms needs to be explored. The findings in diverse small fiber tests are not specific for one or the other diagnosis and can be found also in other painful conditions such as postherpetic neuralgia or postsurgical pain. Here, the underlying mechanisms and the relation of small fiber pathology to the respective pain syndrome are even less well explored and understood.